A sheep graziers weather report warned of frosts, thankfully I was camped under an awing behind a shed. Still I was very cold even with all my clothes on and tucked up in my sleeping bag! Rolling hills, sheep and grain crops were my companions on today’s ride. This tail end of the Nullarbor has been tamed by farmers. Light showers and a strong headwind were the penance I paid for not going harder yesterday. I have been in denial, but the aching joints, dripping nose and cough tell me I have a cold, which makes the going just a little harder. Perhaps I will sweat it out? Knowing that I have to pass through the quarantine checkpoint just before Ceduna, I stop to eat my last apple, sliced then drizzled with honey. I ponder the pleasure principal: The simple things in life really are the best. I watch as a peregrine falcon swoops on a pair of hooded doves, an analogy for our time. “No worries then” he said and waved me through. Officially Ceduna is the end of the Nullarbor Plain. I bought a bumper sticker to prove it from the lady at the information centre. I took a photo of the underwhelming giant oyster. 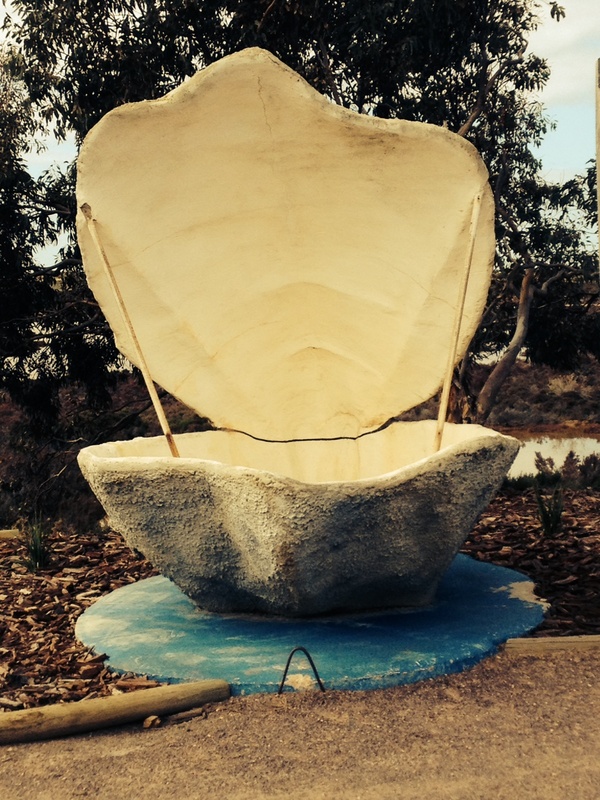 Apparently Ceduna is the oyster capital of Australia, who would have thought! I then cruised down to the foreshore for a look at the pier. There’s not a lot happening on a slow Saturday afternoon. Cops cruising in brawler vans, indigenous people fighting and screaming in the street, while the whites ignore them with practiced indifference as if they were ghosts. I mistook the waving of arms as a positive thing, waving back I’m rewarded with a handful of gravel thrown my way, more out of habit I should think than with any real malice. I ride on as his companions are quick to bring their mate to his senses, yelling at him in Wirangu, the traditional Aboriginal language of the area, spoken for many thousands of years and far older than English. I camp at the Big 4 caravan park on the edge of town, which feels like a gated community, made all the more so as the managers, who seem like a genuinely wonderful couple, are Rhodesian, but sound South African. I’m feeling a little conflicted, there are no easy answers out here. 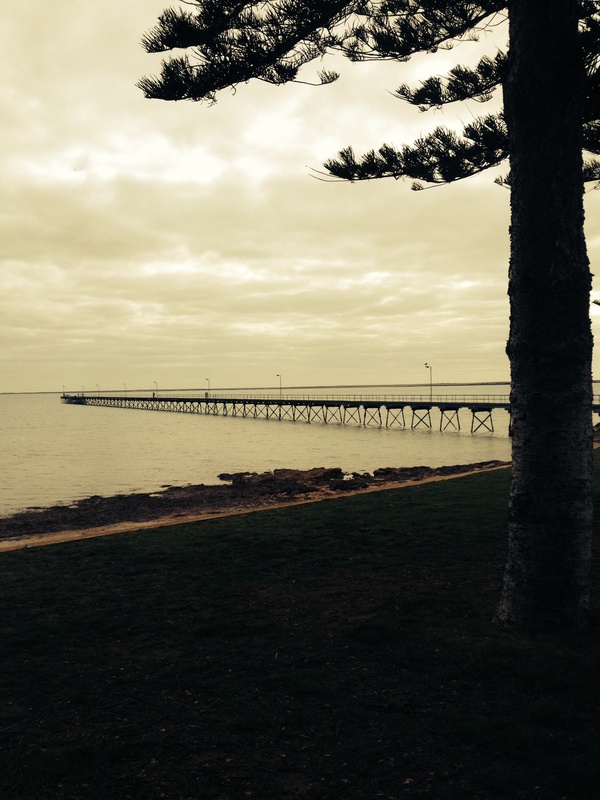 It’s a 110 kilometer run to Streaky Bay tomorrow, here’s hoping the weather improves. Hey nick, none of my business really but if you’re sick why not pay for a cabin? At least that way you’ll be warm and not sleeping direct on freezing earth. Hope you’re feeling better soon!! !